This simple yet adorable game is sure to please the kids! Place suckers of your choice into the holes. 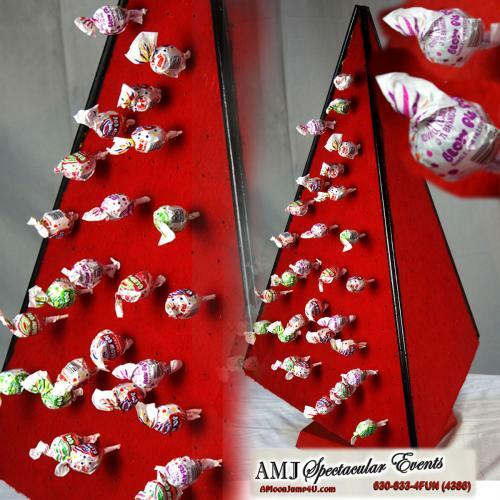 Are you having a Winter Carnival or a Christmas Party for kids, how about a lollipop tree? This is sure to be a hit with everyone! This is a 3D Triangle tree for your Holiday and Christmas Lollipops the kids absolutely love it!! It's quick and easy steps to set it up. No assembly needed! We set up the tree and then you load all the holes with your lollipops! That�s it! Color the bottoms of a few. If a sucker with a colored bottom is pulled, you win a prize. If the bottom of your sucker is white, keep the sucker and enjoy. ( Holds 360 suckers). We provide you enough suckers to fill the sucker pull once. Table not included.